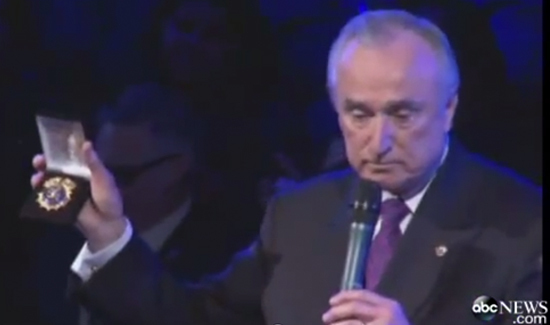 NYPD Commissioner Bill Bratton honored slain Officer Rafael Ramos with a posthumous appointment to Department Chaplain. Ed. Note: NYPD Police Commissioner William J. Bratton delivered the eulogy at NYPD Officer Rafael Ramos’ funeral, held yesterday in New York City. Below is a transcript of his speech. “Every time I attend a cop’s funeral, I pray that it will be the last. But I know it won’t. As I watch the casket carried past all those salutes, I wish it weren’t real. But it is. And as I look into the faces of the loved ones left behind whose worst fear has been so suddenly realized—I silently hope, ‘never again.’ But here we are. “My first police funeral was forty-four years ago. On September 24, 1970, Boston Police Department Patrolman Walter Schroeder was ambushed by a violent group of anti-war extremists, shot in the back as he responded to a bank holdup. In 1970, Boston, like America, was a tumultuous place—protests for civil rights, anti-war demonstrations, anti-government demonstrations, anti-police demonstrations. “Divisive politics polarized the city and the country. Maybe that sounds familiar. The murder of Officer Schroeder shook the foundations of City Hall and the Boston Police Department. It sowed doubt and fear among officers and citizens alike. We mourned, we vowed never to forget, and we moved forward. “And here we are. Here we are to celebrate the life of Police Officer Rafael Ramos, and to honor him. To memorialize the sacrifice he made with his partner that day with his partner for all time—Officer Wenjian Liu. “Here we are to remember. We remember what it means to take ‘the Job.’ No other profession will give you as much, or sometimes, take as much. ‘The Job’ can reward you like no other, but one day it might demand from you everything in return. For the Ramos family, today is that day. And here we are. “We’re in a city struggling to define itself, where people are searching for what they stand for and why, where people claim to know best what it’s like to be everybody else. But we know who we are, because we know who Rafael Ramos was. He was a father, a son, a brother, and a husband. He was a New Yorker. He was a New York City Police Officer. And he was—he is—a hero. “His sister, Sindy, told me that because his dad died when he was an infant, he took on the father figure role for the family as he grew. Cops who served with him said you could see that in the way he worked. “Justin, Jayden—you got the chance to know your dad, the way he didn’t get to know his. You got to learn from him, the way he taught others. Your aunt said your dad knew a little bit of everything, and he was willing to let you know it. Your mom said he was the type of man who, if he set his mind on something, he went for it and did it. Other cops said the same thing: he came on ‘the Job’ older, a family man, street smart. He knew how to handle people, and the younger guys looked up to him. He never shirked a task, and he never complained. You should be so proud of him, as we all are. “But over the last week, you’ve seen that the memorials and this funeral have been about more than just your dad. I know how strange it is . . . so comforting, on the one hand, to have the whole Department in mourning with you, to feel that solidarity, to know that we will never let you be alone again, that we are your family now, just as we were your dad’s. “But a burden, too, having something so private for you be so public at the same time. Because here we are. We’re here because your dad was assassinated. That’s a different word than murdered, which is awful enough. It speaks of the prominence of the person killed; it makes the crime intentional and symbolic. Your dad was assassinated because he represented something—and that’s true, he did. “He represented the men and women of the New York City Police Department. He was the embodiment of our motto: ‘fidelis ad mortem,’ ‘faithful unto death.’ He represented the blue thread that holds our city together when disorder might pull it apart. “He represented the public safety that is the foundation of our democracy. He represented the best of our values, as anyone can see by looking at you and at your family. But he was also your dad. A good man, who tried hard, and sacrificed, and had a desire to serve. When DHL closed one employment door, that desire led him to a new door with our School Safety Division, where he was assigned to the Rocco Laurie Intermediate School, named for another officer slain with his partner, Gregory Foster, nearly 43 years ago. Like Rafael Ramos and Wenjian Liu, these officers were killed for their color—they were killed because they were blue. And that desire to serve led him to enter the Police Academy at 37 years of age. “Your mom said he’d come home pretty tired, competing with all those younger recruits. But he passed with flying colors, wearing the gold braid for being in the top of his class. No small feat. And that desire to serve led him to study to be a chaplain. And I’m privileged to be able to tell you that today I’m making him a Department chaplain—a posthumous member of that family within our family, that ministers to us in time of need. “Rafael Ramos was assassinated because he represented all of us. Even though, beneath the uniform, he was just a good man. And he was just your dad. And maybe that’s our challenge. Maybe that’s the reason for the struggle we’re now in as a city, as a nation. Maybe it’s because we’ve all come to see only what we represent, instead of who we are. “We don’t see each other. The police, the people who are angry at the police, the people who support us but want us to be better, even a madman who assassinated two men because all he could see was two uniforms, even though they were so much more. “We don’t see each other. If we can—if we can learn to see each other, to see that our cops are people like Rafael Ramos and Wenjian Liu, to see that our communities are filled with people just like them too. If we can learn to see each other, then when we see each other, we’ll heal. We’ll heal as a Department. We’ll heal as a city. We’ll heal as a country. “But as Ecclesiastes teaches, there is a time to every purpose under the Heavens. Today, it is time for us to mourn Rafael Ramos. Today, it is time for us to remember Rafael Ramos. And in a few days, we’ll be here again, in a different place that is the same, to celebrate the life of Officer Wenjian Liu. That will be a time for sadness, too. But someday the tears will end. The memories will not. We never have and we never will forget. “I’m proud of them, too. And prouder of none more than Police Officers Wenjian Liu and Rafael Ramos, both of whom I promote today to Detective First Grade. Please let us rise and applaud the lives of Detective First Grade Rafael Ramos and Detective First Grade W enjian Liu, so they can hear us in heaven. So moving! God bless all the LEO’S all over the world.